A traditional English cider apple producing a bittersweet juice. 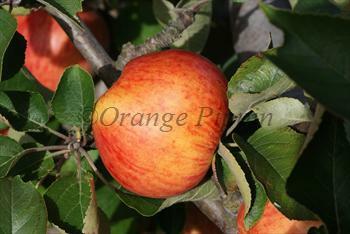 Somerset Redstreak is one of the main commercial cider varieties planted in England. Please fill in the details below and we will let you know when Somerset Redstreak cider apple trees are back in stock. Somerset Redstreak is in flowering group 5. Somerset Redstreak is self-sterile and needs to be pollinated by another tree of a different variety nearby. Like all cider-apple varieties it can also be pollinated by most other apple varieties or crab-apples flowering at the same time. Somerset Redstreak is slightly prone to biennial bearing, fruiting more heavily in alternate years. This can be controlled by heavier thinning in the "on" year. It ripens slightly ahead of the main late-season cider varieties.